"We have brought down dead bodies of some mountaineers who died in recent years, but the old ones that remained buried are now coming out." And a government officer who worked as a liaison officer on Everest added: "I myself have retrieved around 10 dead bodies in recent years from different locations on Everest and clearly more and more of them are emerging now." They point at Nepal's law that requires government agencies' involvement when dealing with bodies and said that was a challenge. "This issue needs to be prioritised by both the government and the mountaineering industry," said Dambar Parajuli, president of EOAN. "If they can do it on the Tibet side of Everest, we can do it here as well." "Hands and legs of dead bodies have appeared at the base camp as well in the last few years," said an official with a non-government organisation active in the region. "We have noticed that the ice level at and around the base camp has been going down, and that is why the bodies are becoming exposed." A study in 2015 revealed that ponds on the Khumbu Glacier - that climbers need to cross to scale the mighty peak - were expanding and joining up because of the accelerated melting. Nepal's army drained the Imja Lake near Mount Everest in 2016 after its water from rapid glacial-melt had reached dangerous levels. "Because of the movement of the Khumbu Glacier, we do get to see dead bodies from time to time," said Tshering Pandey Bhote, vice president of Nepal National Mountain Guides Association. "But most climbers are mentally prepared to come across such a sight." One such waypoint had been the "green boots" near the summit. They were a reference to a climber who died under an overhanging rock. His green boots, still on his feet, faced the climbing route. 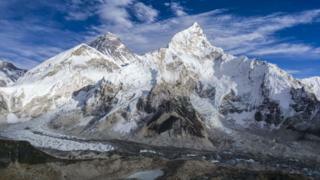 Some climbing experts said the body was later removed while Nepal's tourism officials said they had no information on whether the remains are still visible. "One of the most challenging recoveries was from the height of 8,700m, near the summit," said Ang Tshering Sherpa, the former president of NMA. "The body was totally frozen and weighed 150kg and it had to be recovered from a difficult place at that altitude." "Most climbers like to be left on the mountains if they died," said Alan Arnette, a noted mountaineer who also writes on mountaineering. "So it would be deemed disrespectful to just remove them unless they need to be moved from the climbing route or their families want them."